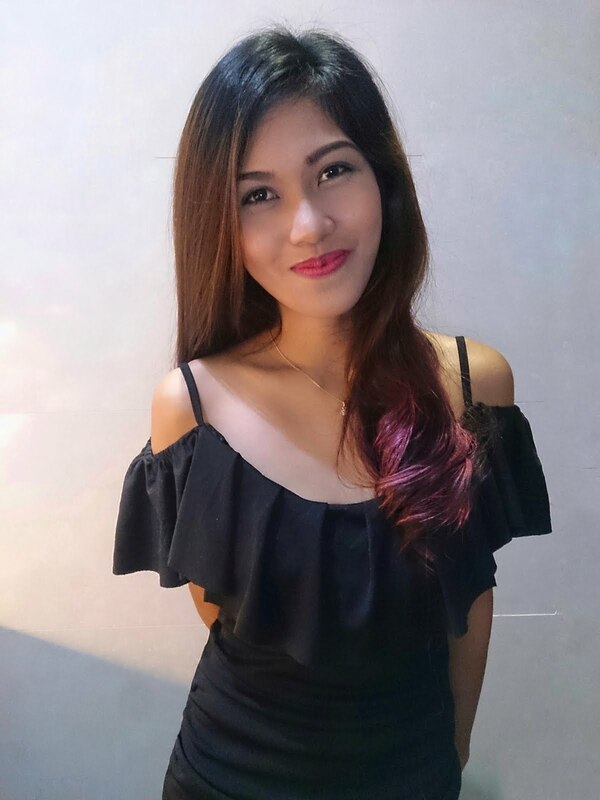 As a Hinatuanon who planned to settle in the City of Golden Friendship, I vowed to immerse myself in the city’s local history, culture, food, adventure, and everything and anything about Cagayan de Oro. So when I got the opportunity to join CDO Heritage Walk, I knew I was only a step ahead of my immersion goals. CDO Heritage Walk is a free familiarization tour which aims to promote the historical landmarks of Cagayan de Oro all the while enticing tourists to visit the city as well as to carry back century-old knowledge lost in the process of modernization. The activity is spearheaded by Northern Mindanao Tour Guides in line with Philippine Independence Day and Cagayan de Oro Charter Day, of which the celebration is called Himugso, held every 12th of June. Little do we express appreciation of the things that surrounds us everyday such that we seem not to see things at all to care for what’s it worth. When Sir Nilo, our tour guide for CDO Heritage Walking Tour asked me what’s my expectation will be, the exact thoughts above surged in my head. I already expect what CDO landmarks to see as our itinerary was already specified prior to the event, but I was thinking how most people tend to overlook significant things just because it’s a common sight. Although markers are placed and museums are available to detail history, everyone might be too busy to spare a time to read. However, as I am armed with the things I learned let me go through what we tackled on our tour. Plaza Divisoria is officially named as Golden Friendship Park. The word divisoria comes from Spanish word divider, as its purpose back in the days was to serve as a divider in order to prevent fires from engulfing the whole area. At present, what you can see here are lots of commercial space and monuments. Plaza El Pubelo Heroes or The Cry of Freedom Monument is dedicated to all the katipuneros (kagay-anons) who fought during the 2nd battle of Cagayan de Misamis known as Agusan Hill. The bolo and the flag that is carried by the statue symbolize armed resistance of the said Katipuneros. Trivia: Uniforms of the dead and wounded katipuneros are kept inside the cabinet placed at the back of the monument. If there is any structure that has survived during the Filipino-American war, it is only Tamparong building which endured all the bombings of the past. It still stands today in the corner of Velez and Divisoria streets, currently the Mang Inasal building. Velez Street was formerly called Calle del Mar or the road which leads to the sea during the Spanish period. Apparently, when you have to follow the road, it will take you to the portside area. Casa del Chino Ygua (Balay na Bato) was the ancestral house of first Chinese immigrants in Cagayan de Oro, the Sia family. This was used as headquarters of the revolutionary forces that fought for freedom of Cagayan de Misamis during the Filipino-American war, whose remains were also buried on its backyard. Now, the house is used for commercial space seemingly forgetting the terror of the past. Trivia: The original bricks of the house were kept by the Sia family. Gaston Park was once called as barangay uno (first barangay) as it was where the first settlement was relocated. Accordingly, 1st settlement in CDO started with a group of indigenous people led by Datu Salangsang and they lived in Himologan, 8kms upstream Cagayan river. During the 1600s, they were converted into Christianity by Fray Augustine de San Pedro and were transferred in Gaston Park. City Museum, built in 1922, was used before as water tower. It was then remodelled into a three-gallery museum that houses the history of three battles of Cagayan de Oro, the pen used to sign the charter of the city, and memorabilia among others that would serve as ‘go-to’ for the people to take a glimpse of how CDO came to be through series of events. Trivia: City museum is a leaning structure in the city. 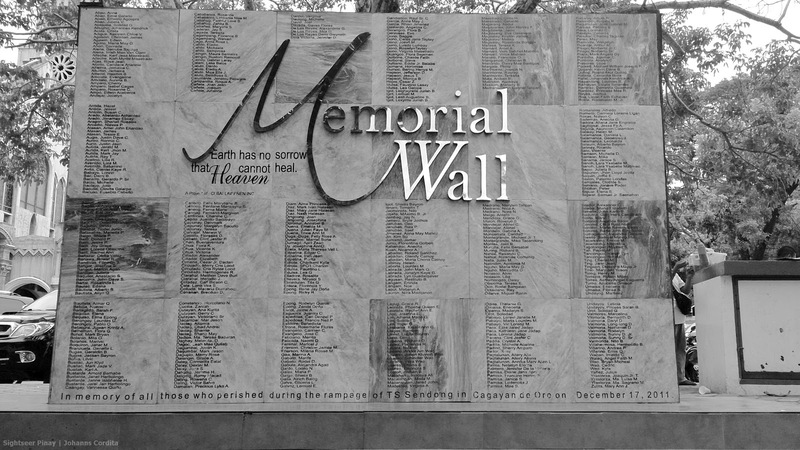 Memorial Wall which was built in the vicinity of Gaston Park near the cathedral serves as a reminder of tragic history in CDO brought about by nature’s wrath. Mother Nature, although breathtaking in its own right, also impose danger when maltreated, hence, the typhoon Sendong in 2011. Scribbled on the wall is an official list of names from MDRRMC of people who died and are went missing. St Augustine Metropolitan Cathedral has been rebuilt a number of times because it was always burned down during the war. With its former material made of wood and grass to stones to concrete, the church was finally completed in 1852 through the efforts of Archbishop Hayes . It stands for --- years now. When the natives governed by Datu Salangsang converted to Christianity, they stopped paying tributes to Sultan Kudarat which made him mad and led the moros to raid the village. To repel any attacks, the villagers built a fort which is now what we know as Duaw Kagayan Park. It is a project of Kagay-anon International, City Tourism Council and all other Kagay-anons worldwide. 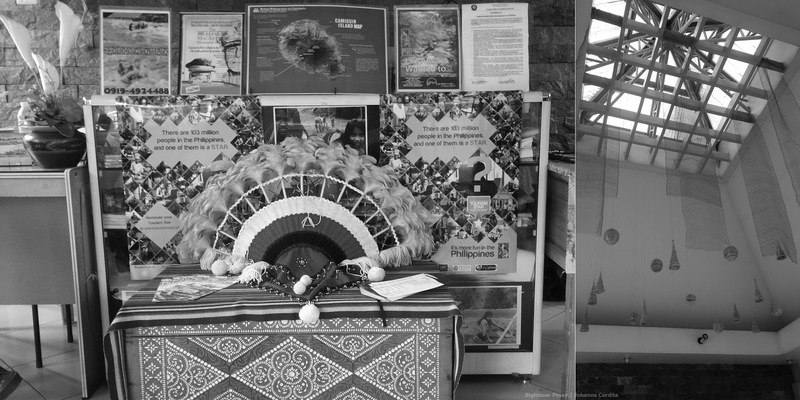 Old photo (right) is originally displayed in Museu, of Three Cultures. Executive Building, once known as Casa Real where the Spanish governor and colonial administration stayed, is also a witness of current history during the proclamation of city mayor, a place where he also goes for duty. There you go! How do you find this article? If you have anything to share, comment down below and follow me on my social media sites for updated travel trails.